The 3-Part Candy Box and Cover is absolutely one of my most favorite pieces in the American line. The Box and Cover is six-sided, which makes for an unusual and visually appealing candy server. With the Cover attached, the height of the 3-Part Candy Box is approximately 4″, with a width of about 6⅛”. These measurements can vary, and there are some published books that document the width at 7″. Actual Fostoria catalogs state the width at 6⅛”, which is what my personal 3-Part Candy Box and Cover measures in at. Just remember that these items were handmade; hence, slight fluctuations in measurements is to be expected. The 3-Part Box, without the Cover. 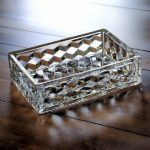 The bottom of the Box is clear glass – void of any cube design. 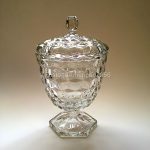 It first came into the American line around 1937, and even though it was produced for several years until the early 1970’s, there were other candy dishes in the American pattern that were produced for longer periods of time. Because of the unique design of the 3-Part Candy Box, and the fact that it had fewer years in production than most of its candy-related counterparts – this piece is not a common item. Even so, these pieces are not too difficult to locate. Many times you will find just the bottom dish, with no Cover – or vise versa. As with all the pieces that had Covers or Lids, you need to make sure the edges of those pieces are not nicked or crushed before purchasing. If you want to purchase a similar item, please click the following sponsored link for available 3-Part Candy Box and Covers on eBay.